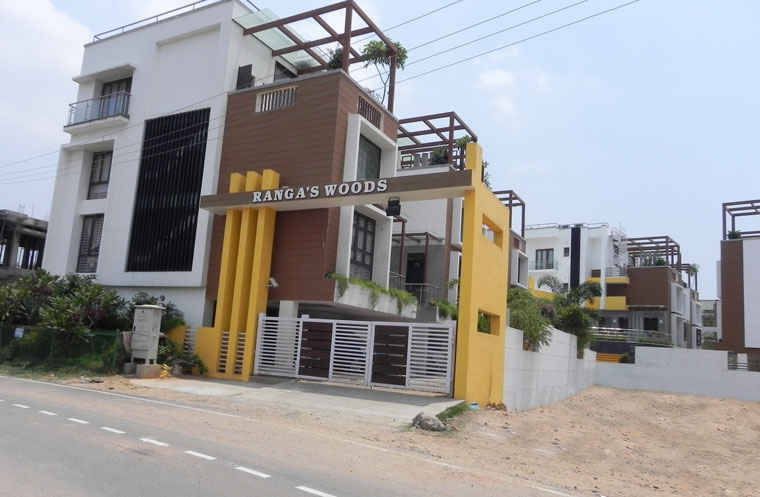 Ranga's Woods is strategically located at Mogappair (Ayanambakkam) near Anna Nagar. Ranga's Woods Offers 11 Luxurious independent villas and exclusive Twin car park with all the modern life comforts .It has Been designed with lush green landscaping and Resorts style lightings. Near 200 ft Bye Pass Road, Plot No : 59 & 66, Aishwarya Nagar, Ayanambakkam (Mogappair), Chennai – 600 095. Ranga Foundation a renowned construction & real estate development company is known for its integrity, quality craftsmanship, and excellence in management. Ranga Foundation is involved in combination of activities involving residential buildings, apartments, and Villas Ranga Foundation was formed by group of experienced & eminent civil engineers as a private limited company in 2001. Since its inception the company has grown steadily. Started modestly in 2001 with one project Ranga's Enclave a four apartment complex has grown steadily year by year. Ranga's is proud to say that with the modest investments made through self funding we have completed fifteen projects. With this success in fold Ranga's has planned to enter into next level of developments. The company's overall objective is to satisfy that market segment that demands integrity and quality construction, and to maintain a steady growth in sales volume that will sustain the company for many years. The management has enhanced the reputation to the point where the company is regarded by many architects as the recommended choice with their clients due to the excellence of its craftsmen and management. We as a team have the dedication and passion to excel. RANGA FOUNDATIONS is an GOOD builder. It has 5 on-going projects with total inventory value of Rs.245 Cr and 12 completed Projects. Location of this project offers decent life style and has access to Workplaces, Super Markets. But does not have access to Cafes, Star Hotels. etc. It has access to Super Markets like Super Market Rack and Parks like Sriram Nagar Park and Schools like DAV Boys Senior Secondary School and Malls like Chandra Metro Mall and Workplaces like AIEMA Technological Centre This location is recommended for people who have 24x7 help for daily needs. Main doors frames and shutter with Burma teak Wood. Frames of other Doors, Windows & Ventilators made of Teak Wood. Other Door shutters made of 35mm thick first quality commercial flush with both side plastic coating. Windows provided with plain, tinted & stained glasses as required and with architect designed M.S.grills. All steps and living areas with granite. Ground floor bed, First Floor Kitchen, Store, Pooja and Top bed room floor with branded first quality Vitrified Ceramic tiles. Second floor bed with Pergo brand wooden flooring. All toilets with branded Anti skid ceramic tile flooring and ceramic tile dadoing. Kitchen countertop with Black Granite slab and 2 height branded ceramic tile dadoing. Hot & Cold water provision in all bed room toilets; All CP fittings are Jaquar or other equivalent. Parryware, Hindware or other equivalent accessories. 3 Phase E.B supply to every house. Geyser provision for all bed room toilets. Power back up for common area usage. A.C provision for all Bed rooms. Finolex or equivalent make wires confirming to IS & MK Switches. All elevation wood works with polishing. All ceiling with tractor emulsion. All inner walls with Asian Plastic Emulsion over Birla putty and outer walls with Apex Ultima over Birla putty. All grills with synthetic enamel paint. All steel pergolas with ICI DUCO paint over DUCO putty. Ask from 3 other people who enquired about Ranga Woods. Review of Ranga Woods, Mogappair? Its price, location, builder etc. Review of Ranga Foundations, Mogappair? construction quality, trustworthy, delivery history etc.? Review of Ranga Woods, Mogappair location? neighbourhood, connectivity, schools etc.? Comparison of Ranga Woods, Mogappair to nearby projects? Is it rightly priced? What is your feedback on this Ranga Woods, Mogappair? Depends on brand name and complete the project in time etc? Will this be a better option for investment or to live in Ranga Woods, Mogappair? Can you give some suggestion? Is the Ranga Woods, Mogappair has more potential in terms of capital appreciation, ROI, Rentals, Proximity to social infrastructure etc?